Megan B, Megan M, Chiara and Rachel Rouge modelling at Dr Sketchy's Wellington. Many many of us want the black corded corset now. If you liked that bustle, here's one it inspired. 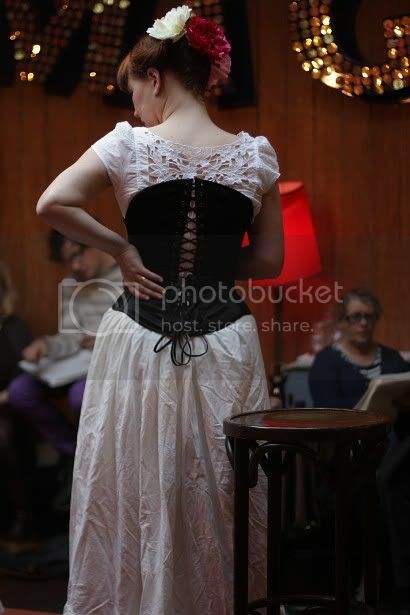 I'll let you in on a secret - the sewing machine came into common use in the mid-Victorian era, around about the time this type of bustle was fashionable. The more complicated sewing techniques using the technology to its full effect - curved seams, bias cuts and the like - had yet to be widely used. What this means is that many of these garments (not the corsets, they're a bit specialised) are put together using really simple techniques - straight seams and not many of them - and are quite suitable for beginner seamstresses. I can bead, embroider, silk screen, and otherwise decorate cloth... but for the life of me I cannot sew two pieces of it together. Ah, I thought you were learning to sew. Perhaps I am thinking of someone else? My mom was a fantastic seamstress, arthritis has made her stop. She made my steamcoat for me, with help. It could be you that I was thinking of. How's that going? 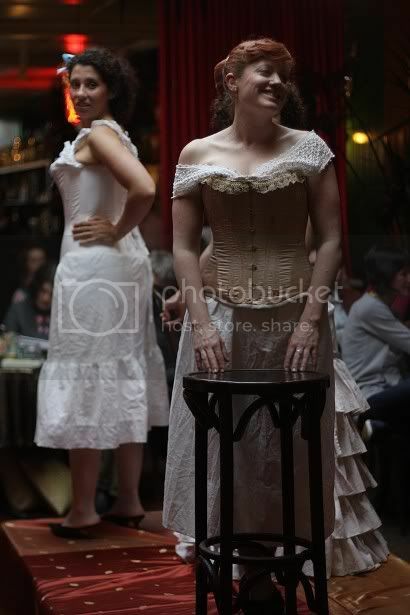 Any interest in late 1800's bustle-skirts?